At SVARW’s March breakfast meeting, Lt. Col. Robert “Buzz” Patterson, U.S. Air Force (Retired) had an enthusiastic SVARW audience enthralled with stories of his personal contact with Bill and Hillary Clinton. As the Senior Military Aide to President Clinton from 1996 to 1998, he was responsible for carrying the emergency satchel, also known as the “nuclear football,” which contains the president’s nuclear launch codes. The bag must accompany the president 24/7, which requires the military aide to have a bedroom close to the president and to travel with him. Patterson related that he’d been politically uninvolved and focused on the Air Force and his missions before he was selected for the critically important job. Witnessing behavior he described as “completely lacking in basic morality” on numerous occasions, and “pathological lying” on a daily basis turned Patterson into a committed conservative upon his retirement from military service. 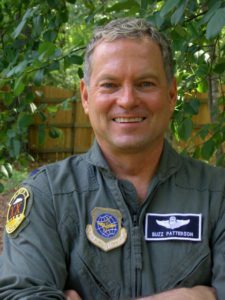 Patterson retired from the active military to take up a career as a commercial airline pilot, until his retirement in the mid 2000s. 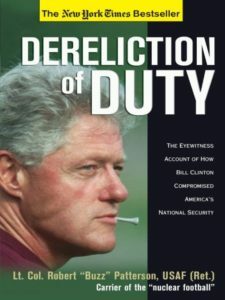 A third career as the author of his first book, “Dereliction of Duty,” led to numerous appearances on Sean Hannity and Fox and Friends. He’s also appeared on the Rush Limbaugh and Laura Ingraham radio shows. Patterson told of the time Clinton misplaced a card called “the biscuit,” which holds the codes required to launch nuclear weapons. Clinton had been drinking and partying heavily the night before the Monica Lewinski scandal broke in the national media. When Patterson went to wake him that morning, as he did every morning, to authenticate that Clinton had the biscuit, Clinton held his head in his hands and admitted that he’d misplaced it and couldn’t remember the last time he’d seen it. A panicked search of the president’s living quarters and his previous day’s locations ensued. Never located, the codes had to be recreated through the chain of command from the top brass in the Pentagon, down through the ranks to nuclear submarines and missile silos. Describing Clinton personally as “a man with absolutely no moral scruples,” Patterson related that once on a long flight on Air Force One, he’d been sitting in the cockpit when a young female enlisted flight crew member was found in the galley sobbing after the president had cornered her in his quarters and molested her. She wanted an apology from the commander-in-chief. Patterson said Clinton apologized but without admitting he did anything wrong. Sometimes it takes an immigrant to help us realize the exceptional nature, and Godly heritage of America. Malcolm McGough is an Australian citizen, but a permanent legal resident and enthusiastic booster of our American system of self-government. A former CEO of the Election Integrity Project California, McGough informed an enthusiastic SVARW February General meeting how a recently-decided landmark Judicial Watch lawsuit forced the removal of 1.5 million inactive voters from the Los Angeles County voter rolls and opened the door for more lawsuits challenging voter fraud across the country. Candidate Donald Trump recruited McGough to help rally Californians to become active in key midwestern and southern States that voters in those states might be persuaded to flip to the Republican candidate, even if the overwhelming numbers of California’s “winner take all” invalidated Conservative votes. The key to mobilizing Californians in 2016, and hopefully in 2020, is the 108 million Evangelicals who didn’t participate in the election. Trump’s growing popularity with Evangelicals because of his support for abortion restriction, alliance with Israel, and First Amendment protections of religion and speech will drive voters who are disgusted with both parties to register and vote Republican if they understand the stakes of the next election. The key to winning elections, he opined, was to engage those who are sitting out elections through voter registration via community engagement, church/synagogue activism, and strong voter integrity lawsuits. Abortion, immigration, jobs and taxes can motivate dispirited or new voters to register and turnout, when issues like a Socialist agenda, late term abortion, Supreme Court nominees are at stake. He thinks that a wedge can be driven between openly Socialist, late term abortion, radical Democrats and moderate Democrats, if Trump is the alternative. “America was never meant to be a secular Democracy,” said McGough. “From the Mayflower Compact to the Constitution, America’s founding documents are a moral compass, guiding us to prosper.” The Left has sought to remove God from our society, legally since 1963 with the ban on prayer in school. 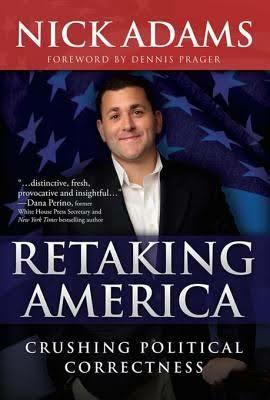 That removal paved the way to infanticide, speech codes and anti-Semitism. Trump encourages faith in civic life, along with active participation by Christians and Jews. That is how McGough claims Republicans can win in 2020 and reclaim meaningful political power locally. Attendees at SVARW’s January meeting heard David Rubin tell the harrowing account of the night he and his 3-year-old son were shot by terrorists as Rubin was driving home from Jerusalem. Rubin was shot in the leg, and his son in the head. 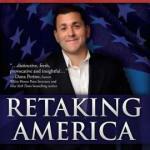 That experience, which they both survived, prompted Rubin to start speaking out about terrorism in Israel. 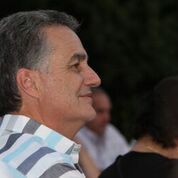 A former New Yorker, Rubin moved to Israel many years ago and served as mayor of Shiloh. Living in Samaria and Judea (the proper Biblical name for the “West Bank”), Rubin and his neighbors have all been affected by terrorism. People don bullet-proof vests and Army helmets to travel to work. There are even child-sized bullet-proof vests, he said. Rubin’s terrifying experience with Palestinian terrorists 14 years ago forced him to realize how everyone in his community must live daily with the threat of attack. As his son healed from the shooting, Rubin realized that children were especially vulnerable to long-term psychological problems living in a community where parents, siblings, young friends and teachers have died in terrorist attacks. 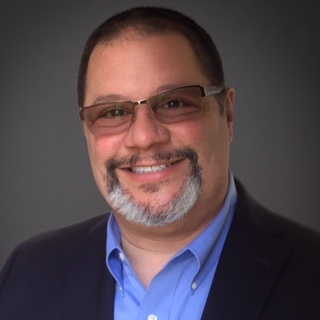 His creative solution was to start the Shiloh Israel Children’s Fund, which offers a variety of therapy for children who have experienced trauma. He explained that children work through their trauma with play, art, working with animals, music and other activities. Rubin praised President Trump’s support for Israel, especially for moving the U.S. embassy to Jerusalem, for pulling out of the nuclear deal with Iran and for closing the Palestinian Liberation Organization’s office in Washington, D.C. His newest book, “Trump and the Jews” explores the relationship between the president and the Jewish people. The warmth of the Christmas season was celebrated by nearly 100 SVARW members and guests at Maggiano’s Little Italy in Santana Row on Dec. 12. The invocation was given by Brian Rechten, new SVARW member, representing 860 AM The Answer, and author of Devotions from Proverbs, a copy of which he presented to the luncheon attendees. President Jan Soule and the Executive Board were sworn in by Santa Clara County Supervisor Mike Wasserman. The Executive Board for 2019 will be led by President Jan Soule. The First Vice President will be Rosa Brown and the Second Vice President, Wendy Brukwinski. 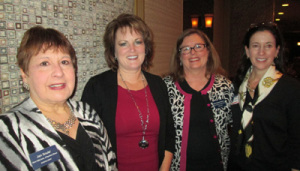 Lisa Seago will continue her valuable role as Treasurer, and organizer of our Christmas Luncheon. Sherrill Martinez will continue as Recording Secretary, as will Susan Calderon, Corresponding Secretary, and Diane Owen as Parliamentarian. Following the swearing in, Mr. Wasserman gave a summary of important issues facing our county during his last term in office. His second (and last) term work in promoting business expansion, new housing, county road repairs, and efficient management of the County Sheriff’s Office and Social Services, is important in keeping our county taxes as low and efficiently managed as possible. Every year, SVARW selects a charity to support at the luncheon and throughout the year. This year’s charity, The JW House, provides a home away from home when loved ones are in the hospital or having surgery. Located on the campus of Kaiser Permanente Santa Clara, outpatients and family can visit at no charge to have a quiet place to rest, check emails, shower, or eat a meal. All area hospitals are supported. Daily meals are provided by restaurants, community volunteers and families. The homey atmosphere provides a feeling of normalcy to families facing medical crises. The JW House was the dream of JW Knapen, a San Jose teen who battled several debilitating illnesses before succumbing to brain cancer in 2005. With the help of his physician, Dr. Alan Wong, and his mother, JW’s dream came true when the house opened in 2008. Anne Marie Knapen, JW’s mother, gave an inspiring and informative talk about its history, its mission and how our membership can support JW House. Bettina Kohlbrenner, Executive Director and Jill Popolizio, Executive and Marketing Director were both in attendance to answer questions. More than $700 was collected at the luncheon to support JW House. Donations and volunteers to prepare meals are always welcome. Please contact Kathy Imamura at kdimamura@gmail.com if you are interested in helping. Conservatives are right to worry about the influence of socialism on the United States. Socialism is the “little brother of communism” and it is incompatible with the ideals and values of America. SVARW’s October speaker, June Gilliam, spelled out the dangers of communism and its creeping influence in the U.S. Gilliam, who moved to the U.S. from China 20 years ago, now describes herself as “an American patriot.” But her transformation didn’t happen overnight. As a young person in China, Gilliam was a member of the Communist Party and came to the West with many communist lessons intact. Once in the West, however, she started to learn how the Chinese government suppresses art, traditions and spirituality. Ten years ago she attended a performance of Shen Yun, which depicts 5,000 years of Chinese culture. It was the first time she’d seen that side of China. Gilliam could not reconcile the beliefs of the Communist Party with Shen Yun’s portrayal of China’s vast and rich culture. Which one was the truth, she wondered. Today, the American left and China are both working to advance the socialist and communist agenda in America, she said. Western culture’s influence is growing in China, which creates a threat to the communist system. Communism can survive only by erasing a people’s culture, art and spirituality, Gilliam explained. She urged conservatives to stand against socialism and communism. Steve Frank says that the Republican party is dead. If the current trend continues, registered Republicans in California soon will be the third place party, behind Democrats and “decline to state” voters. In some cases, Republicans are running as decline to state candidates in order to have a chance at winning in a state that overwhelmingly elects Democrats. The statewide party doesn’t do the basics of voter registration and get out the vote efforts that should be the most important functions of a political party, he said. Frank, longtime Republican activist, columnist and frequent radio commentator, bluntly told the SVARW crowd on March 28 about the death of the Republican party. “In 2016, Donald Trump won the presidency in spite of the Republican party.” Trump represented the people of the party, not its establishment. But the party’s death doesn’t mean that SVARW and similar groups should abandon efforts to elect conservative candidates. Frank said there are groups all over the state that advance conservative values without assistance from the state Republican party. He urged SVARW to start developing and training candidates now for the 2020 elections. “It takes planning. We should be looking for candidates now; we should be looking for them and training developing them,” he said. “People in city council races win not because of great conservative theories but because they know how to fill potholes,” he said. Taking on the right issues can advance conservatism, even in California. Many people are familiar with the advice to “vote early, vote often,” as a call for rigging elections. They’ve heard stories about dead people voting, ballots gone missing or ballot boxes stuffed with fraudulent votes for a particular candidate. The new touch-screen voting machines are the latest devices that can leave election results in question. 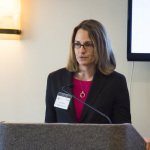 SVARW’s February speaker Orlean Koehle detailed the many ways that unscrupulous people can tamper with voter registrations, ballots and election results. As a poll worker in Santa Rosa in the 2016 primary, Koehle said she encountered several voters whose registrations had been switched from Republican to Democrat, when the voters themselves had not made the change. In California, 11 counties have more registered voters than they have adults living in the counties. County officials explained this away as a result of not culling inactive voters on the rolls, but there is no explaination why the other 47 California counties don’t have the same problem. In Trinity County, elections always tilt 70 to 30 percent in favor of Democrats, a result Koehle says is tied to voting machines rigged to provide that result. Touch-screen voting machines can be programmed to change a vote from one candidate to another, Koehle explained. Other states reported voter fraud as well. “In Colorado, dead people were voting,” she said. “Someone is getting records of these people and keeping them alive and voting for them.” In Maryland, 31,000 votes were recorded by dead people and jammed voting machines were reported in Michigan, but only in Republican districts. In fact, one estimate puts the number of invalid voter registrations for the 2016 presidential election at 18 million. One way SVARW members and other conservatives can challenge voter fraud is by working at the polls or volunteering to be poll observers. A large and enthusiastic crowd greeted gubernatorial candidate Travis Allen at SVARW’s January meeting in San Jose. 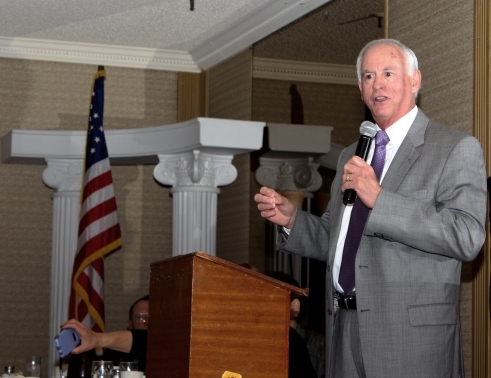 A Republican assemblyman from Huntington Beach, Allen told the sell-out audience at Three Flames about what he will do if elected California governor in November 2018: focus on bringing down taxes, fixing the state’s roads, improving education and directing construction of water storage facilities. He challenged the idea that California needs a full-time legislature. “I don’t believe that legislators should be full-time. These guys have to constantly justify their existence. They have to write more and more laws,” he said. Democrats have had control of the state legislature for the last 39 of 40 years, giving California the highest poverty rate, the highest unsheltered homeless rate, a failure to provide water storage for droughts and an inadequate education system, he said. Allen is the only one of the three major Republican candidates for governor who publicly supported and voted for Donald Trump. Even though California is heavily weighted toward Democrats, Allen said the numbers show that he can win. Gov. Jerry Brown was re-elected in 2014 with 4.3 million votes. In 2016, 4.4 million Californians voted for Trump. SVARW members and their guests enjoyed a delicious meal and an inspiring message at the 2017 Christmas Luncheon, held Dec. 6 at Maggiano’s Little Italy. The annual charity recipient for the luncheon was Teen Challenge, a non-profit organization that helps both teens and adults recover from destructive, abusive and addictive backgrounds. During the luncheon, three participants in the program shared their touching stories of how the group mentored and assisted them to overcome past problems. An amazing 86 percent of those who have completed the program remain drug-free and are currently employed. As is typical for our generous group, members opened their wallets and checkbooks to support Teen Challenge with this important work. Diners also had the opportunity to meet and talk with two candidates who will be on the June primary ballot for statewide office: Judge Steven Bailey, running for state attorney general, and Peter Kuo, running for state insurance commissioner. The San Jose Police Department is growing again, Chief Edgardo (Eddie) Garcia said during his talk to SVARW members during the Nov. 15 breakfast meeting. Staffing has been a key priority of Garcia, who became chief in early 2016. The force fell from nearly 1,400 officers in 2008 to just under 1,000 in 2014. Police union representatives blamed pension reform efforts and cut-backs by the city for retirements and resignations. In November 2016, San Jose voters approved Measure F, which modified the pension reform efforts, making them more acceptable to the police and public employees unions. Garcia said that some of the officers who left for other departments are now applying to return to the San Jose force. The most recent San Jose police academy class had more than 100 recruits, a vast improvement over the seven who enrolled in the February training, Garcia said. San Jose’s compensation and retirement benefits need to be competitive with other similar-sized cities to attract and retain its police officers, he added. SVARW members were particularly interested in Garcia’s views on “sanctuary cities,” those municipalities that refuse to cooperate with federal agents seeking to enforce immigration law. When an audience member asked about calls to the non-emergency number going unanswered, Garcia admitted that is a problem he plans to address. Unfilled dispatcher jobs contribute to the problem, he said. Garcia was unable to answer questions about the June 2, 2016 Donald Trump rally in downtown San Jose during which departing attendees were attacked by protesters. San Jose’s handling of security for the rally is currently in litigation, preventing Garcia from answering questions about his decisions surrounding the event. Protesters calling themselves “anti-fascists” are actually socialists and communists, guest speaker Neil Mammen told the audience during SVARW’s October breakfast meeting. “There has never been a fascist who wasn’t a socialist,” Mammen said, giving as examples Adolf Hitler, Iraq’s Saddam Hussein, Libya’s Mohammar Ghadafi, Uganda’s Idi Amin and Benito Mussolini, who created Italy’s Fascist Party in 1919. They stay in power by promising benefits (food, housing, health care) to the masses. Mammen expressed concern about police chiefs across the nation who appear to be failing to protect people from protesters. “When the police, the people you hire to protect you, decide to play favorites, they’re not working for you, they’re being criminals. If a police department fails to provide protection to any citizen of whatever stripe and that citizen has their rights violated as a result, the police department should be taken to court for civil rights violation,” he said. He concluded by saying that the only way to save our republic is to teach the young generation the principles on which America is based, principles which include Biblical values and liberty. Their expenses for abortions have increased to the level of $1.5 million per day, over one half billion dollars per year. They bill for ultrasounds, which are done solely to determine what type of abortion to perform. There are plenty of federally qualified community clinics (13,000 nationally) actually providing a much wider range of health care services for low-income women. Expose misinformation and falsehoods, produce videos and harness social media to show the truth behind abortion. Inspire women to choose life, as a precious gift, to see a vision written in human hearts, which is to proclaim the universal truth that life is a blessing. 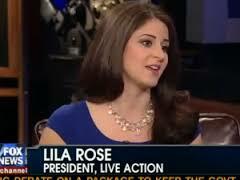 She urged listeners to continue to fight to keep the right to life in the Republican platform. Lila called on SVARW members to get involved in education, defending personhood, building bridges in the political sphere, and to view abortion as violence. 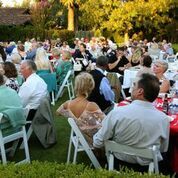 SVARW members and their guests enjoyed a warm evening of fine food, wine and music at the 2017 Stars and Stripes Gala, held Aug. 26 in Saratoga. The event was a chance to meet with elected officials and several candidates who will be running for office in 2018. Conservatives should smile whenever they hear the media attack President Donald Trump. “The minute they stop attacking him (Trump), is the minute he is no longer a threat to them, the attacks guarantee his re-election,” speaker Tim Donnelly told SVARW members at the June 21 meeting. Donnelly ran unsuccessfully to represent the California Republican Party in the 2014 gubernatorial race. He said establishment Republicans worked to make sure he lost the primary, including sending mailers filled with false information. Donnelly has written a book about his experiences following the election. 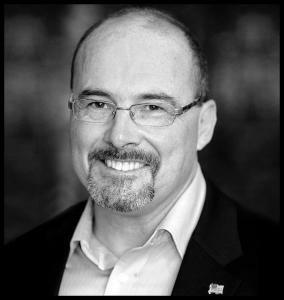 Titled “Patriot Not Politician: Win or Go Homeless,” he shares stories about his time as an assemblyman from southern California’s 33rd District and his run for governor. Conservatives need to send “culture warriors into the media, into entertainment” to counteract the prevailing progressive culture. The State of California, its counties and cities all face a financial crisis if something isn’t done to halt the growing debt that comes from public employee retirement plans. 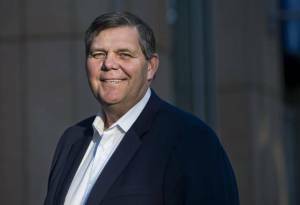 While he was mayor of San Jose, Chuck Reed spearheaded a local effort to rein in the costs of future pensions for city employees. Now, more than two years after leaving office, Reed continues his work to reform public pension plans. 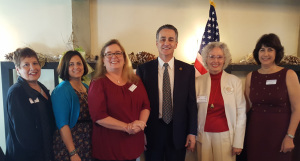 Former Mayor Reed spoke to an overflow crowd at the April 19 meeting of the Silicon Valley Association of Republican Women, held at the 3 Flames Restaurant in San Jose’s Willow Glen neighborhood. In essense, the state, counties and cities must sacrifice growing amounts of their budgets each year to fund the pensions. Before San Jose voters overwhelmingly approved Measure B in 2012, the city was on a trajectory toward bankruptcy. That pension reform measure garnered Reed national attention and gave the city council some added tools to cut pension liabilities. Reed compared public employee pension plans to credit cards, with elected leaders racking up more and more debt and making only the minimum payments each month. When they run out of money, they just get another credit card and continue to increase the debt. 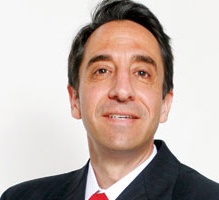 Reed returned to work as a lawyer after leaving the mayor’s office, specializing in real estate law. He said litigation and resulting court decisions may be the only way to modify pension plans. 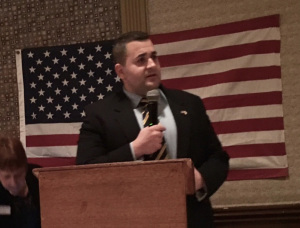 Conservatives need to wrest American culture away from leftists to preserve the political gains made with the election of President Donald Trump, Nick Adams said at the March 15 meeting of SVARW. A native of Australia, Adams is applying to become an American citizen and recently published “Green Card Warrior,” his book that recounts his battle to immigrate to the United States. In an effort to educate today’s youngsters about what it means to be American, Adams has created the Foundation for Liberty and American Greatness, FLAG, which will “train youth to understand American greatness, value their liberty, defend their country and engage the culture, as well as exposing and neutralizing the propaganda arm of anti-Americanism: the global news media.” FLAG will train college-aged conservatives to spead the message at public and private schools. Already, Adams has been to 35 schools in eight different states, training young people to be proud of America. FLAG soon will release a “kid-friendly” version of the U.S. Constitution, written to appeal to elementary children. 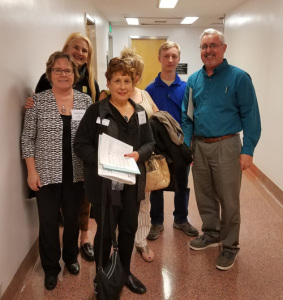 Lobby Day in Sacramento—We Learned! We’re Empowered! Just showing up at 6:00 AM at the Curtner Light Rail Station should have earned everyone who boarded the bus for Lobby Day on March 13th a gold star! On a comfortable bus with new and old friends to chat with the trip to Sacramento flew by quickly. With a pit stop in Pleasanton, our bus rolled up to the California Secretary of State’s Building just as check in for Capitol Resources’ Citizen Lobby Day was underway at 9:00 AM. As we gathered in the auditorium for the initial training session, we were all awed by the number of people who showed up coming from all over the state including over 100 that came from Chino Hills in Southern California (having boarded a bus at midnight!!) In our training session we learned how a bill becomes a law passing through appropriate committees and both houses of the legislature before being signed or vetoed by the governor. (See diagram http://leginfo.ca.gov/gif/bill2law.gif). 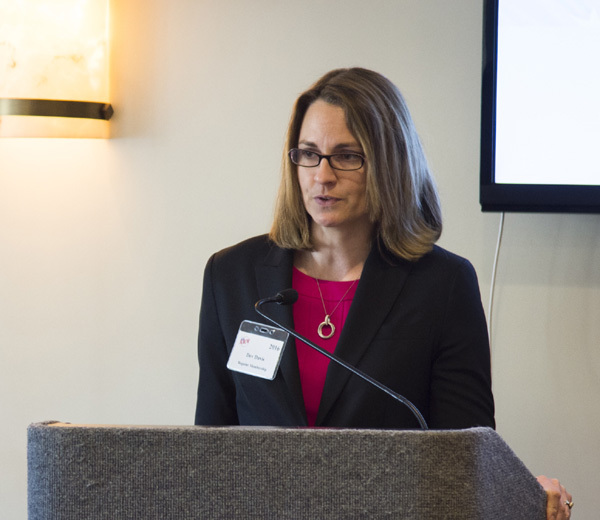 Karen England, the Director of Capitol Resource, reviewed the Ten Commandments of Effective Advocacy. CRI divided the attendees into groups each with a leader who had participated in previous lobby days. 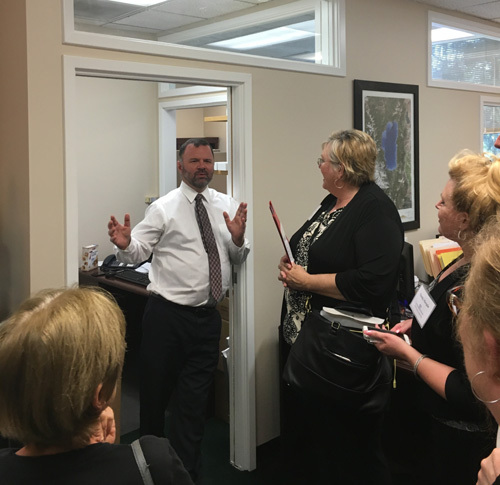 Each group was assigned three to four members of the Assembly to visit in their Capitol Building office. Since members of the SVARW troop ended up in different groups, I can only speak about the experiences of my assigned group. 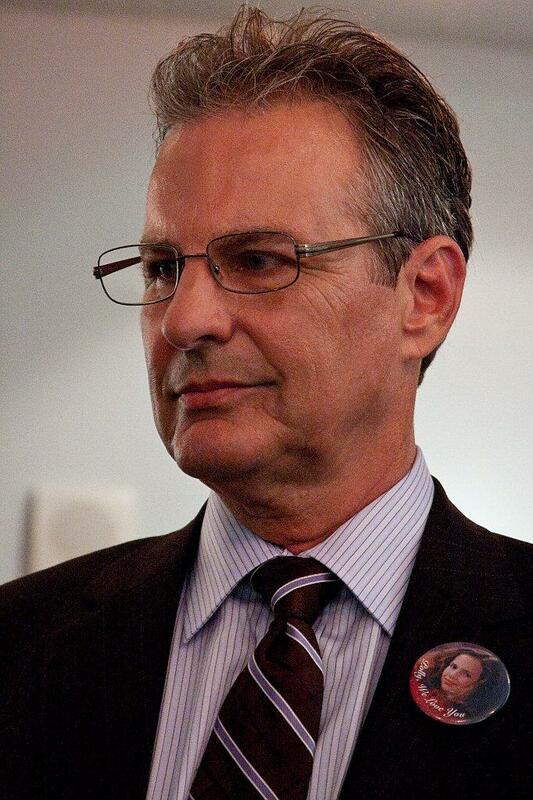 Our first assigned senator was Jeff Stone a Republican representing District 28 in Riverside County. As is typical, the staffer asked if we had an appointment which of course we did not…but when he heard we were there to oppose SB18 we were ushered in and got to spend about 10 minutes with the senator. I asked Senator Stone what was the best way to impact legislation and he said to bombard the legislator’s offices with email, fax, phone calls and petitions preferably on a focused day. Our other two assigned senators were Democrats whose staffers gave us a few minutes to explain our opposition to SB18 and said that their senator hadn’t made a decision. The benefit to Capitol Resource is that they now know who they can count on to oppose SB18 and those they still have to work on. All those that attended Lobby Day said that they felt empowered by the experience. Some were excited just to have the opportunity to tour the Capitol Building. The SVARW Board discussed the possibility of organizing our own mini-lobby days to visit our local Assemblyman and State Senators in their district offices. Stay tuned! For 20 years, Marc Klaas watched his effort to protect children result in lower crime rates. But recent efforts to reduce prison sentences are erasing the gains that helped protect children from the type of criminal who killed Klaas’s 12-year-old daughter Polly in 1993. At the Feb. 15 meeting of SVARW, Klaas retold the events that took place after his daughter was kidnapped during a slumber party in Petaluma in the fall of 1993. It took law enforcement 65 days to find her body and during that time, Klaas worked tirelessly to keep her face and story in the news. At the time of her abduction and murder, Klaas worked in San Francisco as a rental car agent. But he knew he couldn’t go back to that job. Instead, he took the skills and knowledge he’d learned dealing with the media and law enforcement to begin advocating for laws to protect children. He founded the KlaasKids Foundation, which focuses on finding missing children, supporting their families, helping victims escape human trafficking and advocating for laws that protect children. It was his daughter’s murder and the prior violent record of her killer that sparked the passage of California’s “three strikes law” in 1994. The law required minimum 25-year sentences for offenders who already had two previous convictions for violent or serious crime. The KlaasKids Foundation provides a wealth of resources for parents about ways to keep their children safe. In this new age of the internet, Klaas urges parents to be vigilant about knowing what their children are doing on the internet. It’s a good idea for kids to have cell phones, he said, and parents should always trust their gut feelings if something feels wrong. Terry Turchie expresses no doubt that Silicon Valley is rich with potential targets for terrorism. 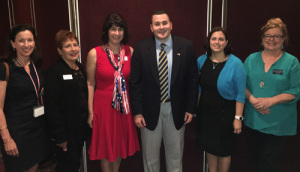 High-tech businesses, local airports, utility infrastructure and even agricultural land were identified as possible targets by Al Queda as early as 2003, he told the audience at the Jan. 25 meeting of the Silicon Valley Association of Republican Women. Working on those two cases gave Turchie a unique look into the mind of lone offenders, who act independently but claim affiliation with a larger cause, such as ISIS. As Turchie explained, “ These people, all their life, they wanted to belong to something greater than themselves, a cause. They were never able to find that cause, or group.” ISIS’s goal of a global caliphate provides the cause these lone offenders seek. He described the current situation as a “dead-on collision between international terror and domestic terror. Turchie also explained how crucial the public is to solving crimes and identifying potential terrorists. It’s important to trust gut instincts and not try to rationalize away those feelings, he said. A festive crowd gathered on Dec. 7 to celebrate the holidays and support a good cause at SVARW’s annual Christmas luncheon, which this year was held at A Bellagio restaurant in Campbell. The SVARW board had chosen the Salvation Army to be the annual charity. 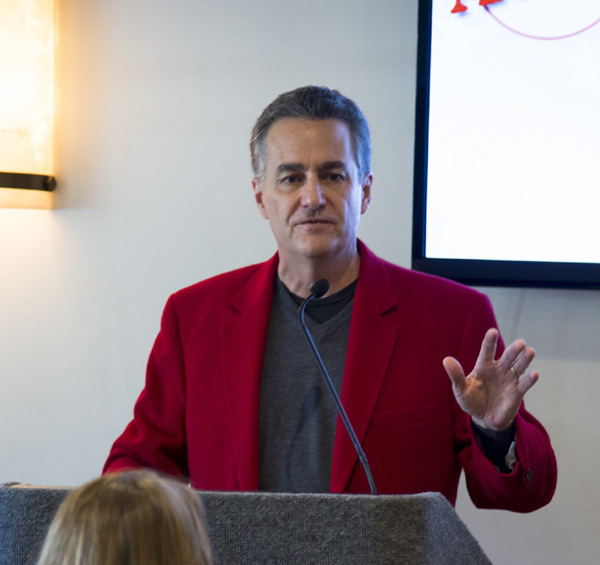 Salvation Army representatives shared information about the organization’s founding on the streets of London and its growth into a modern global ministry that serves millions. 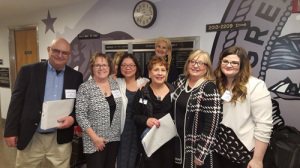 In addition to the Salvation Army, SVARW sponsor RealOptions Pregnancy Medical Clinics provided a round-up of its 2016 successes and made its Giving Tree available for members to support the pro-life clinics. Greg Von Gehr and Major Gaylene Yardley from the Salvation Army shared information about the organization from its founding in 1865 by London minister William Booth. Booth took his message of Christian salvation to the city streets where he reached the poor, homeless and hungry. Today the Salvation Army operates in more than 100 countries, staffing 440 homeless hostels, 252 residential addiction dependency programs, 182 children’s homes, 200 homes for the elderly, and 47 mother and baby homes. One of the recipients of the Salvation Army’s services told the SVARW crowd how she had been helped by their local addiction program and was able to get her life back on track. Each Christmas season, she rings a bell for the Salvation Army at one of its Red Kettle donation sites. She urged others to sign up for a two-hour shift of bell-ringing, explaining that the time passes quickly and the experience boosts one’s Christmas spirit. The Christmas luncheon also included the installation of SVARW’s Executive Board for 2017. 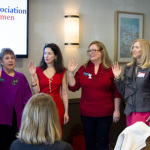 Members are Jan Soule, President; Rosa Brown, First Vice-President; Debra Janssen-Martinez, Second Vice-President; Sherrill Martinez, Recording Secretary, Susan Calderon, Corresponding Secretary; and Lisa Seago, Treasurer. County Supervisor Mike Wasserman administered the oath of office. Republican women have tremendous power to influence others and affect elections. At the Nov. 16 SVARW brunch meeting, guest speaker Jim Brulte, chairman of the state GOP, gave concrete examples of how members can advance Republican principles. Before hearing from Brulte, however, the overflow crowd paused to raise a champagne toast to President-elect Donald Trump. “Don’t underestimate your power to influence others,” Brulte said. “It was a Republican woman who in 1966 invited a 10-year-old boy to get involved in a campaign for a man named Ronald Reagan, who was running for governor.” The 10-year-old Brulte helped paint the campaign office and paste bumper stickers on cars. Since that first foray into politics, Brulte has worked for three American presidents, served as the minority leader in California’s State Assembly and Senate and now serves as chairman for the state party. Brulte delineated the qualities that make for a good candidate. In California, any Republican seeking elected office must be “right on the issues, able to raise a lot of money and inspire a lot of people to volunteer,” he explained. A candidate who lacks just one of those characteristics will not be a good candidate in Democrat-dominated California. There’s little to support among the 17 state propositions on the Nov. 8 ballot, former San Jose City Councilman Pete Constant told the overflow crowd at the last SVARW general meeting on Oct. 19. With a 224-page voter guide and issues ranging from legalizing marijuana to banning the death penalty, voters face a daunting task of sorting through the often-confusing language and intent of the propositions. Constant helped clarify many of the key issues that voters will decide at the polls next week. Overall, Constant urged the SVARW members to reject any tax proposals, revenue bonds, and new fees, which means a “no” vote on nearly all the propositions. There were a couple of propositions that garnered Constant’s support, however. Those include Prop. 53, which would require voter approval for any revenue bonds in excess of $2 billion, and Prop. 54, which would require the state legislature to make public the text of bills at least 72 hours before voting. He also urged voters to reject local school bonds and parcel taxes. “Every time you vote for a parcel tax or bond, you are reinforcing bad behavior in the state house,” Constant explained. The state won’t take responsibility for fully funding education as long as residents keep approving local measures, he said. Putting more people in prison for longer terms doesn’t necessarily equal a drop in crime. What does help is smarter and better policing, says Jeff Rosen, Santa Clara County District Attorney, who spoke to the SVARW general meeting on Sept. 21. Rosen said he has examined historical crime rates looking for trends. In particular, he compared Canada to the United States. The crime rates paralleled each other, rising and falling in sync through the decades. Since the 1990s the United States has vastly increased the rate of incarceration and experienced a decrease in the crime rate. But those two events are not necessarily related, Rosen said. Canada’s crime also decreased but the incarceration rate didn’t change. From 1925 to 1975, the U.S. incarcerated about 100 people per 100,000 people. That number is now 700 per 100,000, unmatched by any other country that provides such statistics, Rosen said. The challenge for San Jose right now is the drop in the number of police officers on the force. Just six years ago the city had more than 1,200 officers. Today there are about 800. Rosen said that just the presence of an officer in a high crime area drops the crime rate to zero while that officer is present. The District Attorney’s office files about 40,000 criminal cases per year, with 30,000 of those being misdemeanor charges. More than 90 percent of those cases are resolved before coming to trial. 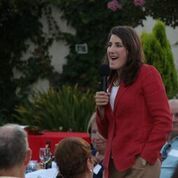 The Silicon Valley isn’t immune from terrorism and just as in the rest of the world, soft targets such as store, schools and churches could be targeted, March speaker Jess Guy told the SVARW members gathered for brunch on March 16. “We’re all vulnerable,” said Guy, a former special agent with the Bureau of Alcohol, Tobacco and Firearms. “It is a threat whether it’s radical jihad or some nutcase.” ISIS, he said, is just the latest name for a group of radical Islamists whose goal is to establish a caliphate. “For 600 years radical Islam has been trying to wipe out the west,” he said. Guy was one of two speakers in March to discuss threats to personal safety. Steve Brown, owner of Echelon Security, spoke about the challenges to law enforcement presented both by terrorists and others. Brown explained a concept called the “impression of control,” the image that the government and law enforcement has control over a chaotic situation. If a felon escaped from San Quentin Prison and was spotted in San Jose, police officers would stop responding to routine calls in order to focus on finding the felon. “The system cannot survive with all of us our here believing the system doesn’t work,” Brown said. “It starts to crumble apart when we look at a convict, a criminal who’s out on the streets, who’s escaped.” The escape gives the impression that our most secure facilities, prisons, cannot contain the criminals, he explained. Brown said the government has been adding tactical weapons and vehicles to local law enforcement agencies in order to be ready to heighten the impression of control in the event of natural disasters or civil unrest. Our SVARW December 16th Christmas Luncheon held at California Café in Los Gatos was a great way to end our year and kick off 2016! Our program for the day began with the installation of SVARW officers for 2016. 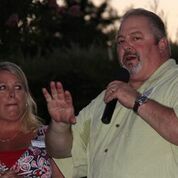 Performing the ceremony was Supervisor Mike Wasserman representing Santa Clara County District 1. 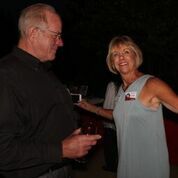 SVARW appreciates the long standing support of Supervisor Wasserman. Prior to administering the oath of office to our incoming officers, Supervisor Wasserman provided an update on some of the ways this lone Republican on the Board of Supervisors has been able to make a positive impact on local government efficiency. 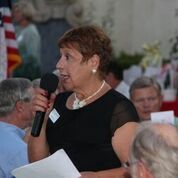 In addition to Supervisor Wasserman, SVARW was pleased to introduce other office holders and candidates including Dev Davis and Steve Brown who are running for San Jose City Council, Margaret Metcalf representative to the RNC from Guam and our longtime friend, former US Congressman Ernie Konnyu. As SVARW has done every December since our founding, we featured a local charity as our speaker and focus for our Christmas meeting. This year Carol Patterson, Vice President of City Team was our guest. Cityteam was founded in San Jose, CA in 1957 and provides a variety of life changing programs that help people truly change their lives out of poverty, hunger and addiction. From its inception in San Jose, City Team has grown with locations in San Francisco, Oakland, Portland, Philadelphia and 51 international countries. Without accepting any government assistance, San Jose, Cityteam serves over 650 hot meals a day. Carol invited members to consider volunteering one day in the preparation of the meals. Cityteam also provides safe shelters for the homeless, showers, clean clothing, youth mentorship, and long-term recovery for men, women and children. The generous guests at our luncheon donated over $1700 to help Cityteam continue their local efforts! 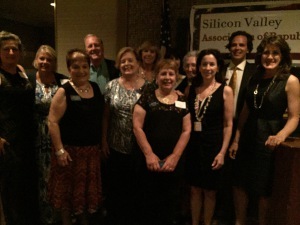 Over 100 Silicon Valley Conservatives turned out on August 15th to enjoy an evening of dinner, dancing and meeting office holders and candidates. 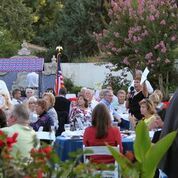 The event began with appetizers as guests met and mingled with the top two candidates for the Republican nomination of U.S. Senate, Duf Sundheim and Tom Del Beccaro. It was encouraging that both of these men, who have previously served as Chairman of The California Republican Party, emphasized that they understood why Republicans are dishearten by most of the current Republicans in the US Senate. 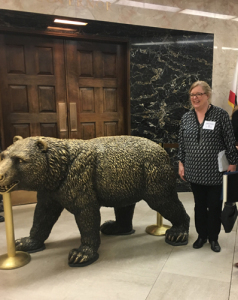 And….California Assemblywoman, Catherine Baker. After dinner, Assemblywoman Baker, a longtime friend of SVARW, talked about the challenges she faces in the Democrat dominated legislature. Representing the 16th Assembly District that spans from Alameda to Contra Costa County, she is the ONLY Republican representing the Bay Area in Sacramento. Assemblywoman Baker’s election to the legislature stunned Democrats and deprived them of the two-thirds majority that they needed to raise taxes at will. Needless to say, the Democrats are gunning for her seat and she definitely needs our support! Hoping to join Assemblywoman Baker in the Assembly is Eastside High School District Board Member, Van Le. Van has been a member of SVARW for a number of years and we certainly want to encourage her efforts in 2016. 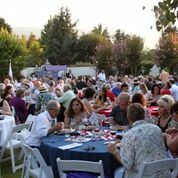 After dinner guests enjoyed an array of desserts and dancing to the big band sound of the Sons of Jubal. Where else in Silicon Valley can conservatives have fun, meet office holders and candidates and not worry about being politically correct?? Many thanks to the SVARW Board for their many volunteer hours spent putting this event together! A trend toward regional government must be stopped because it will severely limit personal liberties and property rights, speaker Debbie Bacigalupi told the SVARW members at May’s meeting at the Three Flames Restaurant. Drawing on information from the United Nations, local government agencies and historical events, Bacigalupi explained how American communities are being crafted to dramatically change how people live, work and travel. In particular, California is serving as a pilot program for regionalism, a means of governing an area that transfers power from elected city council and county boards to regional entities, such as the Association of Bay Area Governments (ABAG). The underpinning political philosophy to regionalism is sustainable development, a planning process that emphasizes public transit and high-density housing while discouraging suburban and rural housing. Bacigalupi criticized sustainable development, which is defined as “development that meets the needs of the present without compromising the ability of future generations to meet their own needs” (source: “Report of the World Commission on Environment and Development: Our Common Future,” also called the Brundtland Report, after Gro Harlem Brundtland, the commission’s chairwoman and former prime minister of Norway). Sustainable development can encompass concepts as wide-ranging as economic justice, environmental justice and climate change. California’s current water shortage is partly a result of the state’s unwillingness to build new dams for water storage, a concession to environmentalists, Bacigalupi said. She urged SVARW members to fight the regionalism efforts and to stand for our republic. “What’s happening with liberty and freedom? It is disappearing,” she said. “America was founded on dreams. America was born to win. “It was based on God’s creation, natural law, individual rights. That’s what makes America worth fighting for. Regardless of how tired you are. Regardless of how sick you are. Regardless of how poor you are. This is the most important battle of our lifetime,” she said. Americans are losing their liberty as the government expands its efforts to force people to ask permission before engaging in behaviors that previously required no government approval. At SVARW’s April meeting, attorney Timothy Sandefur of the Pacific Legal Foundation spelled out a chilling vision of how the progressive approach to governing is encroaching more and more into areas that America’s founding fathers considered God-given rights. The brilliance of the U.S. Constitution is that it gave rights to the people and government has to ask permission of the people in order to govern. Progressives turn that idea upside-down. “As we drift away, farther and farther, toward the permission society, I am afraid that we are abandoning the principals that we hold dear,” he concluded. In the question and answer session, Sandefur explained that “Most of the laws under which you live your life are not written by elected officials. Most laws are written by hired bureaucrats at administrative agencies. These agencies exercise a wide variety of powers that we really don’t pay much attention to.” Through his work with Pacific Legal Foundation, Sandefur attempts to overturn these laws that restrict liberty and freedom. 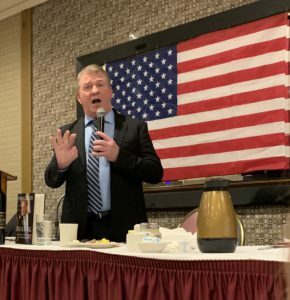 Pragmatism and moderation will kill the Republican Party’s relevance, Kevin McGary told the audience at March’s regular meeting at Three Flames Restaurant. Republican candidates and party members must be willing to stand for social issues such as the right to life and traditional marriage, he said. 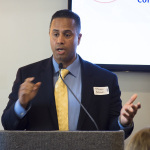 McGary, chairman of the Frederick Douglass Foundation of California, provided an historical perspective on the party’s rich background in standing up for justice. The party was founded on a social issue: abolition of slavery. Principles of justice should remain the bedrock of the GOP, he said. But many Republicans want to leave social issues out of the party’s platform. That is a mistake, he warned. Those who don’t want to deal with social issues, but are fiscal hawks, are really conservative Democrats, in the model of JFK, McGary said. Today’s progressives often talk about “economic justice” and “social justice.” This is an opening for conservatives to educate them about the founding fathers’ views of justice. “Fundamentally justice begins in the womb. Our founders were brilliant. The first principle was life,” he said. The Constitution is a contract between citizens and their elected officials, who must be held accountable to that contract, McGary concluded. Mr. Nan Su enlightened our enthusiastic SVARW crowd at the February general meeting. A charming and self-effacing gentleman, he gave a view on China that could only be presented by an immigrant who fled China’s repressive government for America’s opportunities and freedoms. Su highlighted the great 5,000 year old history and culture of China with roots in Confucianism, Taoism, Buddhism, and later, Christianity in the 18th and 19th centuries. Those traditions value loyalty and fealty to one’s family first, fellow humans second, and government last. Su recalled that the Chinese Cultural Revolution destroyed the people’s religious practices and symbols, along with their rich arts culture, replacing them with loyalty and a duty to the state and its repressive human bosses. During the Cultural Revolution of the 1960s, hundreds of thousands of people were killed, starved and tortured in order for the communist regime to wield complete power over the people, their land and their wealth. China was turned inward and isolated from much of the West until President Nixon initiated relations in the 1970s. With growing trade bringing prosperity to China, the people began to demand more freedom and opportunity, culminating in the 1989 Tianamen Square Protests and government crackdowns on the dissidents. A key point Su made is that an escalating number of organized protests, approximately 180,000 this year, are bringing to the world’s attention the Chinese people’s unhappiness with their government. The protests are costing the government nearly as much as it spends on the military to suppress. Greater freedom to travel, Western business, tourism, and the internet let Chinese people know there is another world, offering freedom and opportunity. With the loosening of Chinese cultural and religious practices, the government seeks to restore the Chinese people’s fundamental human desire for God, family and freedom. It hopes to buy the people’s favor with at least the appearance of restoring their ancient culture, arts and values. Su is disappointed that the U.S. government doesn’t seem to support the Chinese people’s freedom movement, or those in Iran or Russia, for that matter. He sees our support of those movements as an effort to secure Western freedoms though avoiding war. Our maintenance of a strong national defense and enforcement of our own trade secret and patent laws is the US’s best defense against Chinese elite kept in power by a corrupt system and international reluctance to push back against them. He offered a video of a 100 percent American-scripted and produced multimedia show, Shen Yun, which is shown in most of Asia (except China) and the West, which reinforces China’s rich cultural history and invites its viewers to support the Chinese people’s freedom movement. 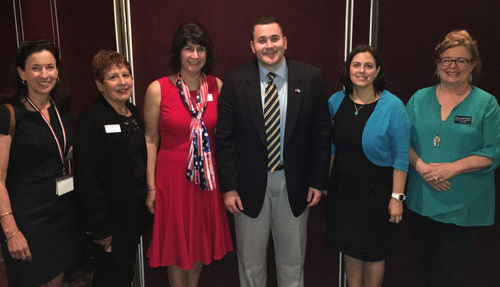 Assemblywoman Shannon Grove, second from the left. 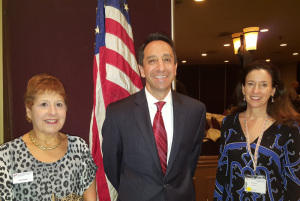 Our first meeting of 2015 on Jan. 21 drew a big crowd as conservatives came from miles away to hear from California Assemblywoman Shannon Grove, a Republican representing Kern County. They were not disappointed. Her message to the audience was to stand up and be the party of Reagan. We can win without becoming the “Democrat-light” party. “The best poverty program we can give anyone is a job,” she told the audience, spotlighting key conservative values of hard work and self-sufficiency. Yet the GOP has failed to put up candidates who will stand for solid conservative values, she said. Grove urged members of the audience to get involved and work or campaigns or seek office themselves. You can keep up with Assemblywoman Grove by visiting her website, and then signing up for her newsletter. Attendees enjoyed SVARW’s new meeting location at The Three Flames restaurant on Meridian Avenue in San Jose’s Willow Glen neighborhood. If you missed the January meeting, don’t miss the Feb. 18 speaker, Nan Su. You also will enjoy a great hot breakfast, including eggs, bacon, sausages, toast and fruit, prepared by Three Flames staff. 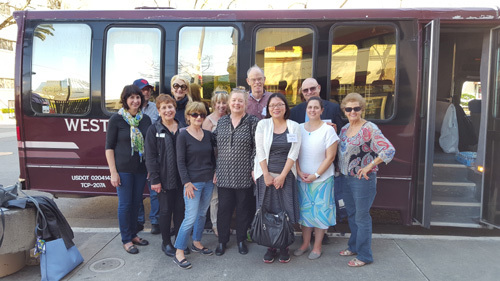 SVARW members gathered at the beautiful California Cafe in Old Town Los Gatos on Dec. 3 for the annual Christmas celebration lunch. Betsey Striebel, manager of the Palo Alto Fisher House, addressed members about the role of the Fisher House in serving veterans’ families. Started by philanthropists Zachary and Elizabeth Fisher in 1990, the 64 Fisher Houses across the United States provide free housing to the families of veterans while the vets are receiving care at nearby military hospitals. Striebel said there is no limit to how long families can stay at the Fisher House and this service helps support vets by keeping loved ones nearby. The Fisher House was SVARW’s 2014 Christmas was charity and more than $2,400 was donated at our luncheon. To donate, contact Striebel at betsey.striebel@va.gov or call 650- 493-5000, ext.60384. Also at the December meeting, Santa Clara County Supervisor Mike Wasserman swore-in the SVARW 2015 executive board members. Popular guest speaker Charlie Self returned to SVARW on Nov.19 to address how we can confront a rising movement of Global Jihad. Self, also known as “Dr. 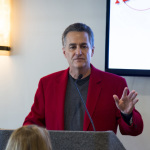 History” to listeners to KSFO’s Brian Sussman radio talk show, always shares a big picture perspective, teaching and enlightening the audience. His talk combined the context of Islam’s imperative to spread its religious message with the realities of geopolitics and economic and social frictions facing our nation today. He thoughtfully analyzed how Judeo Christian and secular democracies can push back against an increasingly conflicted and violent radicalization of Muslims everywhere, including in the U.S. Self was encouraging, saying freedom of mass communication, travel, education and economic prosperity are the most potent antidotes to oppressed people who are encouraged toward violence and jihad, which destroys the innocent of all faiths and forms of governments. Guests gathered in the lovely home of Tom and Martha Snodgrass to meet and mingle and raise money for SVARW endorsed candidates: Chuck Page (California Assembly), Peter Kuo (California Senate), Phil Reynolds Jr. (Campbell City Council), Pete Constant (West Valley College Board of Trustees), Dr. Richard Fox (US. Congress), and Matt Harris (Judge Superior Court).